We had shopped around at various locations in St. Louis looking at quartz slabs for our kitchen countertops. The process was overwhelming until we stumbled across (literally) K&D Countertops in Ballwin. From the moment we walked in, we felt like we were being catered to. Steve at K&D was amazing to work with. He talked us through the process, gave us ideas on colors, patiently helped us look at sample after sample. He explained the various front edge finishes and available sinks and faucets and he never stopped smiling. Being able to actually see the slabs as they would look on a countertop made all the difference in arriving at a final decision. And being able to actually take numerous quartz samples home was awesome! The installers were also great as well. The two young men, friendly and neat, arrived at our home on time and worked meticulously to get the job done. I’ve not seen things done with such precision and caulking done that well in a long time. Kudos to K&D in Ballwin, Steve and the installers for making our countertop selection experience wonderful! We replaced our existing countertops with Cambria. The whole process was quick & went very smoothly. They kept us informed & were very professional. Our installers Thomas & Cameron were top notch. We were very happy with their attention to detail. I would recommend K&D highly. K&D exceeded my expectations. I worked with Kelly at the O’falLon, Mo location. Kelly was very professional and pleasant. She was knowledgeable and addressed my concerns. The showroom has a great selection of Cambria colors and patterns. The slabs are large enough to envision what it will look like once installed. They offer a variety of counter top edging to complete the look. Once I made my selections I was given a quote. Two days later someone was at my home to take precise measurements. The following week they scheduled installation. The two installers were friendly, and professional. They removed the existing counter and sink and installed the new counter, sink and faucet. They know their profession. The communication was excellent with scheduling and on time service. Thank you to K&D and all the employees who were a part of this kitchen project for making me so happy. I will not hesitate to do business with K &D on future projects and highly recommend them. Vickie Nuckles. k&d did an AWESOME job installing our new countertops. at my local store cheryl spent alot of time with me picking out just the right color. wes at my local store worked with me tirelessly to work out my sink placement with the engineers. the installers were prompt, courteous, and extremely knowledgeable. though maybe a small thing – whatever mess they did make – which wasn’t much – they cleaned up afterwards. 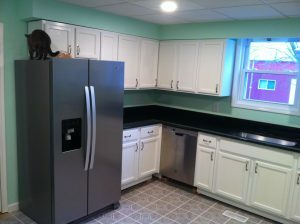 i would HIGHLY recommend k&d countertops to anyone looking to replace their existing. this was quite a refreshing experience! GREAT JOB! Wonderful experience! Excellent service from the sales team and the lead time was quick once we made our decision on a color. The installers were on time even with the additional help to lift my huge piece, they worked quickly, and made sure everything was correct to my standards. The countertop we chose turned out to be incredible. Highly recommend this for your countertop purchase! Great service from the store to installation! We LOVE our Cambria vanity top. The purchase was a great experience from beginning to end. Steve was extremely helpful and kept us up to date on the timeline from order to delivery. He made the whole process easy. We couldn’t be happier with our experience at K&D. We are very pleased with our new counter top. The men worked hard the entire time they were here. We hope to spend many years enjoying our counter. Thank you. Always a pleasure dealing with K&D. Selection and service can’t be beat. K&D were excellent from the very beginning. We walked into the Fairview Heights location and were wowed by the many different countertops on display. Troy was very professional and helpful in giving us an estimate based on our measurements of the kitchen. We compared prices and they were the most knowledgeable, cheapest and had a bigger selection of any other store. Our countertops were installed within 2 weeks of our first visit and we absolutely live them. Highly recommend K&D to anyone wanting to replace their countertops. This is the 3rd time buying countertops from K&D and they have been a pleasure to work with every time! They have top notch service and their selection and quality is amazing! I worked with Jeremy on this last purchase for my pantry and he was knowledgeable, friendly and responded quickly to any questions I had! Also Kenny and the rest of the crew who install are great and they make sure it is absolutely perfect! I will never go anywhere else! Highly recommended!!! Did a awesome job!!! Amazing experience working with Kelly at K&D Countertops. The showroom had so many colors and patterns to choose from. Kelly’s experience and patience allowed us to make the perfect choice for our kitchen. Once we decided to go with K&D the process was like clockwork. They kept their appointment time thru the templates to the installation. Can’t be happier! K&D was very professional the whole process. If there were any changes or concerns, they called us or sent us a text to let us know. We are very happy with the product and absolutely love our countertops! I’m very pleased with my entire experience with K&D! I found a reasonably-priced granite, could get a 15-year sealant on it so it’s lower maintenance, and the service from selection, to template, to install was fantastic! I couldn’t be happier with my decision. Thanks K&D team! Actually 4 1/2 stars, but I rounded up. Great experience from my showroom visit through to the installation of my beautiful countertops and sink. I did have a very small issue with the backsplash not getting caulked on installation day, but the issue was partially fixed the next working day. Partially because the caulk tech did not put down tape prior to caulking on my textured walls. Not a big deal and I fixed it myself the next day, but it cost K&D half a star. Would I use them again or recommend them? DEFINITELY!!!. They were all great they do amazing work I’m very happy with the end result. They did an excellent job coming out and measuring and installing our countertop. Came out looking great. Great service all around. Jeremy at the showroom was very helpful. Great company with superior products and friendly staff. Very nice work. When beginning the process to replace my countertop, I asked several people advise on where to get it. They all said K&D countertops had the best selection for quartz and granite. I went to the Trenton showroom where Jeremy was helpful and let me take many samples home. It was helpful to see many of them in large slabs. Once I made my selection, it was about two weeks to installation. Everyone on the team was professional and competent. My counter is beautiful. I had one small problem and iIt was addressed immediately. I couldn’t be more pleased with the whole process. I can’t say enough good things about my entire experience with K&D, from my very first visit to the showroom on Tesson Ferry right on through installation and subsequent customer service. Everyone I dealt with was extremely helpful, very professional, knowledgeable and personable. I researched a lot of products and in my opinion the Cambria counters simply cannot be beat, certainly not for color and design. My job went off without a hitch due to the attention to detail and hard work of everyone involved in my project. Their showroom was beautifully comprehensive but not overwhelming, and made decisions like edge selection and faucet/sink choices (where applicable) very easy. I’ve been assured I can contact them again if the need ever arises. It’s hard to go wrong with K&D! Great place to get great countertops! The Pendle Hill countertops I purchased from K&D look amazing. The installers did a fantastic job and were friendly and courteous. 100% satisfied!